I am a 27 year old, Buffalo native (Go Bills!). I moved to Hawaii in December 2015 after finishing my Masters in Mental Health Counseling to be with my husband who is currently serving in the United States Marine Corps. We have two fur babies, Toro our black lab and Quorra our beagle. For the last two years I have worked for a local organization that supports homeless Veterans and their families. I completed by first marathon in October 2015 after “training” for a few months with very little guidance. I started to run more after living in Hawaii for about a year. After completing some races in 2017, I joined HRL in July 2017 as a beginner runner and have been running ever since (except for a slight sprained ankle set back in August 2017). What are your upcoming racing plans and running goals? I plan to run as many races in Hawaii as I can before leaving island (whenever that may be). I am hoping to make it back to Buffalo in time for the Buffalo half marathon in May 2018. 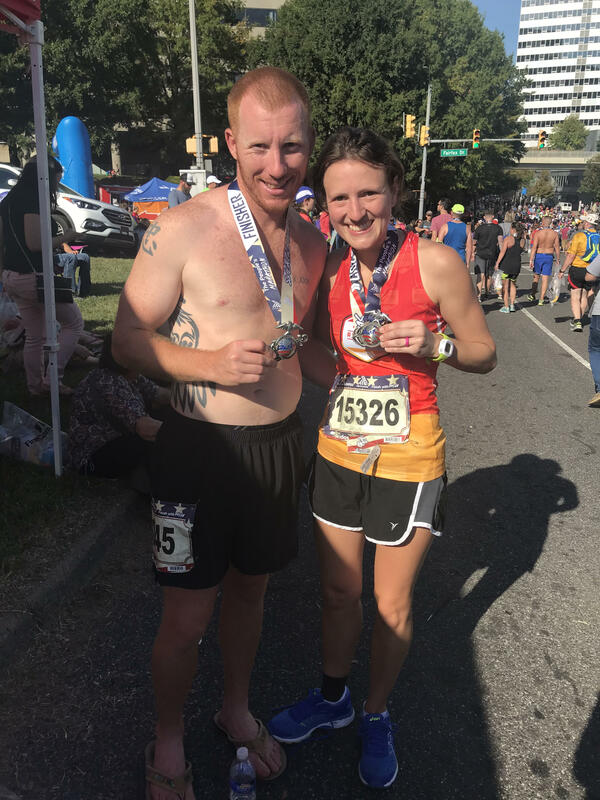 I am also hoping to be selected for the Marine Corps marathon again in October 2018. I would like to work on improving my mechanics this year and finding my true endurance pace after coming back from an injury. Boston Marathon.. someday. NYC Marathon (hopefully 2019). I LOVE Europe so any major half/marathon in Prague, Paris, Germany, Italy. This would require me to workout.. Since living on island we have done a number of hikes which I thoroughly enjoy. Hoping to get into skiing when we return home to the cold Buffalo winters. What is the piece of running gear/food/drink that you cannot go without? My lululemon headband and Garmin watch! What is your favorite running moment or running quote? I wasn’t much of a runner before HRL. I would rely on training plans I could find online and ran at a pace that left me feeling depleted after only a few miles. After working with Michael I learned the importance of having different paces. I learned how to truly listen to my body and provide it with the rest, recovery and attention it deserves. I have become slightly addicted with running. When I have a good run I can’t wait to get back out there. After a “bad” run I gain the motivation needed to get back out there and work on perfecting my newly developed skill. Why does training with Hawaii Running Lab work for you? I am held accountable by a supportive running coach. I have a plan specific to my abilities which has helped me develop and grow as a runner.